DIE Sabbati, videlicet, 28 die Maii. Ordinance for raising Men for Ireland. E. of Leycester's Commission, for raising 4000 Men for Ireland. To send to the King, for a Commission to raise 6000 Men for Ireland. Message to the H. C. for a Conference about the Ordinances for raising Men for Ireland. Propositions to be sent to the King. Message from the H. C. with an Order for stopping Arms going to York. Deputy Lieutenants to be recommended to the Lords Lieutenants. Order for staying Arms going to York. Reasons why Men may be raised for Ireland, according to the Act. Message to the H. C. that the Lords agree to the Ordinance for raising Men for Ireland. Propositions to be sent to the King. Message from the H. C. with an Order for the Quiet of the Northern Parts. The Instructions for Lincolnshire agreed to. Quorum for executing the Ordinance for the Militia. L. C. J. K. B. Leave to be absent. Order for the Quiet of the Northern Parts. The Propositions to be presented to the King. The Ordinance for raising Men for Ireland. 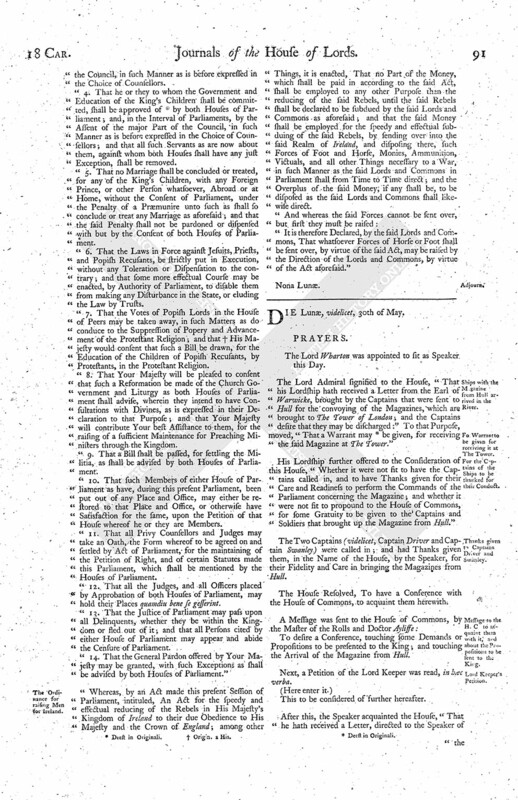 The Lord Brooke reported from the Committee appointed to consider of the Ordinance to raise Men for Ireland and the Committee were of Opinion, "That they think it fit to have a Conference with the House of Commons, about the Interpretation of the Statute for pressing of Soldiers; what Reasons they can give to shew that the Lords have Power to raise Men by that Act. The Earl of Leycester signified to the House, "That he had a Letter sent to him from Secretary Nicholas, to let him know, That, if there be any Defect in the Commission for raising of Four Thousand Men for Ireland, His Majesty will rectify it. Hereupon this House thought it fit to send to the King, to have a Commission for to raise Six Thousand Men; and to acquaint the House of Commons herewith. To desire a Free Conference, touching the Ordinances touching the raising of Men for Ireland. The Lord Admiral reported from the Committees that were appointed to consider of some Propositions fit to be presented to the King from the Parliament; which Propositions were commanded to be read, in hæc verba. 1. Resolved, upon the Question, That this First Article shall be One of those Demands that shall be offered to the King. 2. Resolved, upon the Question, That this Second Article shall be One of the Demands that shall be offered to the King. 3. Resolved, upon the Question, That this Third Article shall be One of the Demands that shall be offered to the King. 4. Resolved, upon the Question, That this Fourth Article shall be One of the Demands to the King. 5. A Question was put, Whether this Fifth Article shall pass as it is, without Alteration. And it was Resolved negatively. Were appointed to draw up this Article with an Alteration, and offer the same to this House. 1. To desire their Lordships Concurrence in an Order for stopping of Arms and Ammunition to be sent to Yorke. Sir Peter Egerton, of Shaw, Esquire, and George Doddinge, Esquire, for Lancashire. Sir Edward Scott to be recommended to the Lord Lieutenant for the County of Kent, to be Deputy Lieutenant for that County. Sir Rob. Parkhurst to be recommended to the Lord Lieutenant for the County of Surrey, to be Deputy Lieutenant for that County. Ordered, That this House agrees with the House of Commons in this Order; and likewise approves of the Deputy Lieutenants to be recommended to the Lords Lieutenants as aforesaid. Whereas it appears to the Lords and Commons, That the King, seduced by wicked Counsel, intends to make War upon his Parliament: It is therefore Ordered, by the Lords and Commons, That the High Sheriffs, and Justices of the Peace, and other Officers, within the (fn. 2) several Counties, Cities, and Towns Corporate, situate (fn. 3) within One Hundred and Fifty Miles of the City of Yorke, shall forthwith take special Care for to (fn. 4) stay all Arms and Ammunition carrying towards Yorke, until they have given Notice thereof unto the Lords and Commons, and shall have received their further Directions: And for the better effecting hereof, the said High Sheriffs, Justices of the Peace, and other Officers, are further to take special Care, that strict Watches be kept within their several Limits and Jurisdictions, for the searching for and seizing of all such Arms and Ammunition, as likewise for the apprehending all Persons going with the same. Ordered, That this Order shall be printed and published. The Lord Wharton reported the Reasons of the House of Commons, which induced them to believe that Men may be raised for Ireland, according to the Act. 1. The Title of the Act, An Act for reducing the Rebels of Ireland, &c.
2. It is said, That such shall be sent over as the Lords and Commons shall (fn. 5) think fit. 3. A Law doth include all Things necessary thereunto, for the executing thereof; where a Subjectmatter is for sending Men for Ireland, pro Bono publico, all Things are given therewith as tends thereunto. That Mr. Reynolds said, That the House of Commons did foresee this Exception. Mr. Lyle said, That it belongs to the Parliament to be Interpreters of the Law, during the Parliament. Whether the Lords and Commons in Parliament may raise Forces of Horse and Foot, Voluntiers, by virtue of this Act, and send them into Ireland?" To let them (fn. 5) know, that this House agrees with the House of Commons in this Ordinance, for the raising Forces for Ireland, adding the Word ["Voluntiers"]. The Lord Admiral reported the Draught of the Fifth Article. Resolved, upon the Question, That this Fifth Article shall be One of the Demands which shall be sent to the King. 6. Resolved, upon the Question, That this Sixth Article shall be One of the Demands which shall be presented to the King. 7. Resolved, upon the Question, That this Seventh Article shall be One of the Demands to the King. 8. Resolved, upon the Question, That this Eighth Article shall be One of the Demands to the King. 9. Resolved, upon the Question, That this Ninth Article shall be One of the Demands to the King. 10. Resolved, upon the Question, That this Tenth Article shall be One of the Demands to the King. 11. Resolved, upon the Question, That this Eleventh Article shall be One of the Demands to the King. 12. Resolved, upon the Question, That this Twelfth Article shall be One of the Demands to the King. 13. Resolved, upon the Question, That this Thirteenth Article shall be One of the Demands to the King. 14. Resolved, upon the Question, That this Fourteenth Article shall be One of the Demands to the King. That they have conceived an Order, will conduce much to the Quiet of the Northern Parts; therefore the House of Commons desires their Lordships Concurrence therein. Ordered, That this House agrees with the House of Commons, in this Order. Next, the Instructions given to the Committees that are to be sent into Lyncolneshire were read. 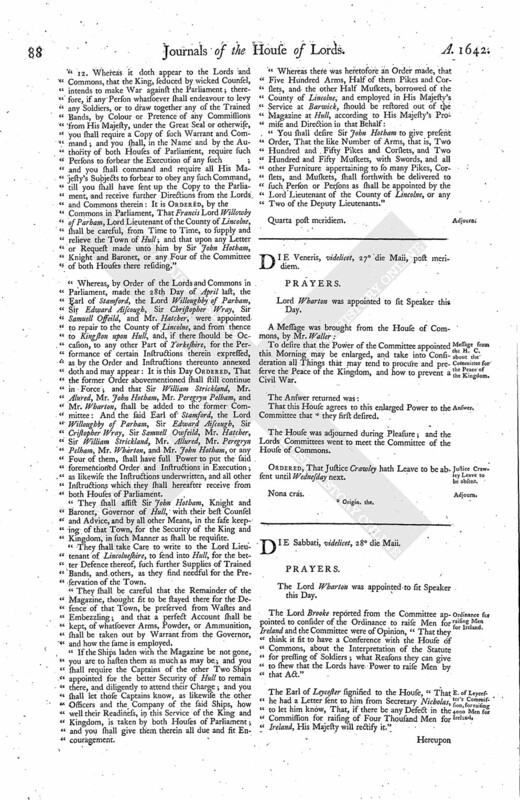 Ordered, That this House agrees with the House of Commons in these Instructions, with striking out the Clause concerning the Serjeant of the Mace. To desire the hasting away the Instructions to Hull and Lyncolneshire; and that a Clause may be added to their Instructions, to require them to be very careful to see the Ordinance of the Militia put in Execution in their County forthwith. 2. That Sir Jo. Banfeild may be recommended to the Lord Lieutenant of Devon, to be Deputy Lieutenant; and Sir Ric. Ingolsby and Mr. Serjeant to be recommended to the Lord Lieutenant, to be Deputy Lieutenants for the County of Berk. Next, the Instructions to be given the Committees at Hull were read. Ordered, That the Quorum of the Committee for putting the Ordinance of Parliament for the Militia into Execution shall be reduced to Three. Ordered, That the Chief Justice of the King's Bench shall have Leave to be absent for Four or Five Days. Ordered, That the Lord St. John's Cause shall be heard on Thursday next; and that the Depositions taken by the Auditors shall be delivered in on Monday next, and that the Witnesses shall appear at the Day aforesaid. Whereas it appears, that the King, seduced by wicked Counsel, intends to make War against the Parliament, and, under the Colour of a Guard to secure His Royal Person, doth command Troops, both of Horse and Foot, to assemble at Yorke; all which is against the Laws of the Kingdom, tending to the Dissolution of the Parliament, and Destruction of His People: It is therefore Ordered, by the Lords and Commons in Parliament, That the Sheriff of the County of Lancaster, and all other Sheriffs of the Kingdom of England and Dominion of Wales, shall, by the Power of that County, and of their several Counties respectively, suppress the raising and coming together of any Soldiers, Horse or Foot, by any Warrant, Commission, or Order from His Majesty, without the Advice and Consent of the Lords and Commons in Parliament; and that all Persons whatsoever do forbear to execute any such Commission, or Warrant, for levying Soldiers, or gathering them together, without Consent of Parliament; and those who shall execute or obey any such Commission or Warrant are hereby declared to be Disturbers of the Peace of the Kingdom; and the Lord Lieutenant of the County of Lancaster, and all Lords Lieutenants of all other Counties in the Kingdom of England or Dominion of Wales respectively, as likewise all Deputy Lieutenants, Captains, and Officers of the Trained Bands, and all Mayors, Justices of Peace, and other His Majesty's loving Subjects, are hereby commanded and required to be aiding and assisting to the said Sheriff of the County of Lancast. and to the other Sheriffs of the other Counties of this Kingdom, and of the Dominion of Wales: And that His Majesty's loving Subjects may the better understand what the Law and their own Duty is in this Behalf, the said Sheriff of Lancashire, and other Sheriffs of the other Counties of this Kingdom respectively, shall cause this present Order forthwith to be published in the several Market Towns within their said Counties. 1. 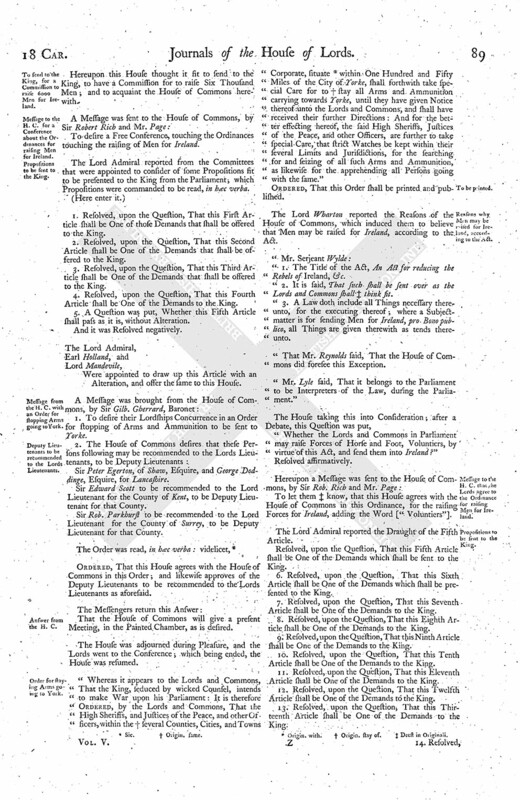 That the Lords and others of Your Majesty's Privy Council, and such Great Officers and Ministers of State, either at Home or beyond the Seas, may be put from Your Privy Council, and from those Offices and Employments, excepting such as shall be approved of by both Houses of Parliament; and that all Privy Counsellors shall take an Oath for the due Execution of their Places, in such Form as shall be agreed upon by both Houses of Parliament. 2. That the great Affairs of the Kingdom may not be concluded or transacted by the Advice of private Men, or by any unknown or unsworn Counsellors; but that such Matters as concern the Public, and are proper for the High Court of Parliament, which is Your Majesty's Great and Supreme Council, may be debated, resolved, and transacted, only in Parliament, and not elsewhere; and such as shall presume to do any Thing to the contrary shall be reserved to the Censure and Judgement of Parliament; and such other Matters of State as are proper for Your Majesty's Privy Council shall be debated and concluded by such of the Nobility and others, as shall from Time to Time be chosen for that Place, by Approbation of both Houses of Parliament; and that no Public Act concerning the Affairs of the Kingdom, which are proper for Your Privy Council, may be esteemed of any Validity, as proceeding from the Royal Authority, unless it be done by the Advice and Consent of the major Part of Your Council, attested under their Hands; and that Your Council may be limited to a certain Number, not exceeding Twenty-five, nor under Fifteen; and if any Counsellor's Place shall happen to be void in the Intervals of Parliament, it shall not be supplied without the Assent of the major Part of the Council, which Choice shall be confirmed at the next Sitting of the Parliament, or else to be void. 3. That the Lord High Steward of England, Lord High Constable, Lord Chancellor, or Lord Keeper of the Great Seal, Lord Treasurer, Lord Privy Seal, Earl Marshal, Lord Admiral, Warden of the Cinque Ports, Chief Governor of Ireland, Chancellor of the Exchequer, Master of the Wards, Secretaries of State, Two Chief Justices, and Chief Baron, may always be chosen with the Approbation of both Houses of Parliament; and, in the Intervals of Parliaments, by the Assent of the major Part of the Council, in such Manner as is before expressed in the Choice of Counsellors. 4. That he or they to whom the Government and Education of the King's Children shall be committed, shall be approved of (fn. 6) by both Houses of Parliament; and, in the Interval of Parliaments, by the Assent of the major Part of the Council, in such Manner as is before expressed in the Choice of Counsellors; and that all such Servants as are now about them, against whom both Houses shall have any just Exception, shall be removed. 5. That no Marriage shall be concluded or treated, for any of the King's Children, with any Foreign Prince, or other Person whatsoever, Abroad or at Home, without the Consent of Parliament, under the Penalty of a Præmunire unto such as shall so conclude or treat any Marriage as aforesaid; and that the said Penalty shall not be pardoned or dispensed with but by the Consent of both Houses of Parliament. 6. That the Laws in Force against Jesuits, Priests, and Popish Recusants, be strictly put in Execution, without any Toleration or Dispensation to the contrary; and that some more effectual Course may be enacted, by Authority of Parliament, to disable them from making any Disturbance in the State, or eluding the Law by Trusts. 7. That the Votes of Popish Lords in the House of Peers may be taken away, in such Matters as do conduce to the Suppression of Popery and Advancement of the Protestant Religion; and that (fn. 7) His Majesty would consent that such a Bill be drawn, for the Education of the Children of Popish Recusants, by Protestants, in the Protestant Religion. 8. That Your Majesty will be pleased to consent that such a Reformation be made of the Church Government and Liturgy as both Houses of Parliament shall advise, wherein they intend to have Consultations with Divines, as is expressed in their Declaration to that Purpose; and that Your Majesty will contribute Your best Assistance to them, for the raising of a sufficient Maintenance for Preaching Ministers through the Kingdom. 9. That a Bill shall be passed, for settling the Militia, as shall be advised by both Houses of Parliament. 11. That all Privy Counsellors and Judges may take an Oath, the Form whereof to be agreed on and settled by Act of Parliament, for the maintaining of the Petition of Right, and of certain Statutes made this Parliament, which shall be mentioned by the Houses of Parliament. "14. That the General Pardon offered by Your Majesty may be granted, with such Exceptions as shall be advised by both Houses of Parliament." 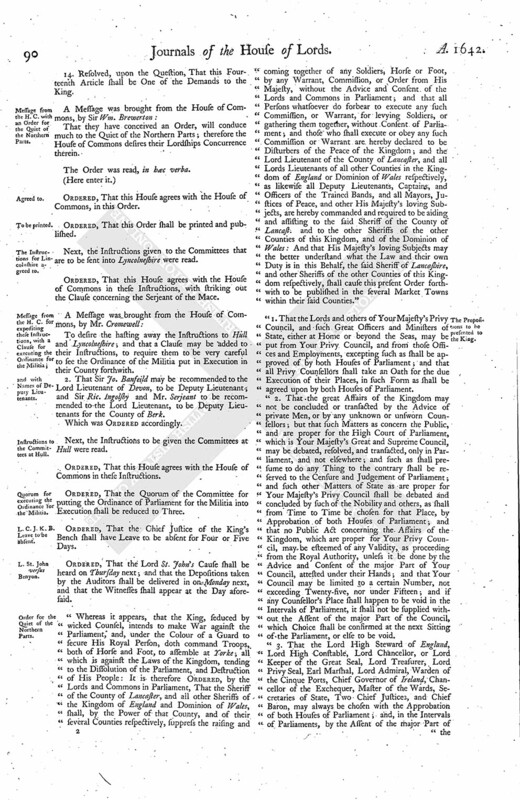 Whereas, by an Act made this present Session of Parliament, intituled, An Act for the speedy and effectual reducing of the Rebels in His Majesty's Kingdom of Ireland to their due Obedience to His Majesty and the Crown of England; among other Things, it is enacted, That no Part of the Money, which shall be paid in according to the said Act, shall be employed to any other Purpose than the reducing of the said Rebels, until the said Rebels shall be declared to be subdued by the said Lords and Commons as aforesaid; and that the said Money shall be employed for the speedy and effectual subduing of the said Rebels, by sending over into the said Realm of Ireland, and disposing there, such Forces of Foot and Horse, Monies, Ammunition, Victuals, and all other Things necessary to a War, in such Manner as the said Lords and Commons in Parliament shall from Time to Time direct; and the Overplus of the said Money, if any shall be, to be disposed as the said Lords and Commons shall likewise direct. It is therefore Declared, by the said Lords and Commons, That whatsoever Forces of Horse or Foot shall be sent over, by virtue of the said Act, may be raised by the Direction of the Lords and Commons, by virtue of the Act aforesaid."